Convert any video to HTML5 for your Joomla! 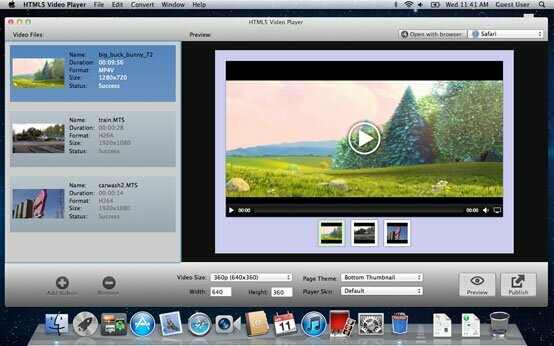 Html5 Video Player is an easy video program that helps you create HTML5 video for your Joomla website in a few clicks. HTML5 is the fastest way to show your video online. Unlike the Flash videos that require a third party browser plug-in in order to play videos on the web. The HTML5 introduces the < video > tag to render web videos easier than ever before. Plus you will gain extra audience from other mobile handsets users, such as iPad, iPhone, Android, Blackberry, etc. All new browsers declare the support for HTML5 video too. How to create HTML5 video for Joomla – The Usual Route? First you need to find some converters and make three versions of your video - .OGG, MP4, WebM. Then, concerning you might have website visitors who are still using old web browsers, add a fallback to Flash version of your video, you need to build a Flash video player too in such case. At last, go to extract an image for poster and write batch lines of HTML5 code to combine all of the above. The coding might be a bit complicate, what’s worse the encoding of source videos to 4 different copies in different codec/formats could be a pain for most of us. How to create HTML5 video for Joomla with HTML 5 video player? You can simply drag and drop your source videos to the HTML5 video Joomla player and converter. Or you can go to the Edit menu >> Add Videos to browse through your video albums on your computer and select to add them to the HTML5 video Joomla software. Once you are ready with tuning the video player, click the Publish button to generate your HTML 5 video Joomla player. It will be saved in the Output Folder of the video tool on your hard disk. Go to the HTML5 menu, then choose Open Output Folder from the drop-down menu list. Now you are ready to publish your HTML5 video to your Joomla website.